« Solving the Confusion of Two Parisville Surnames: The Ciechanowski vs Smielewski Puzzle. Part 2. Establishing land purchase dates helps establish when the pioneers were present in Paris Twp. 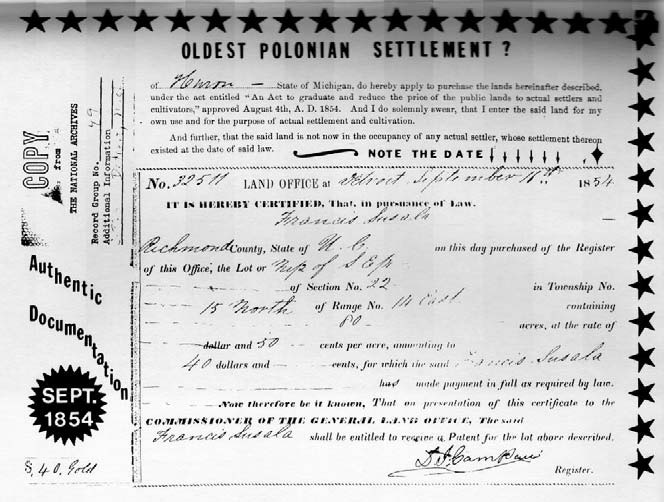 The first and second land patents for Poles in Paris Twp. were obtained by Francis Susalla and Francis Polk. Both of these Land Patents bear the date of July 1, 1857, as issued by the US Government in Washington City. The actual purchase of these parcels was some time earlier. Page 25 of Milostan’s book shows document 32511 for the actual purchase of land by Francis Susalla. It is dated September 16, 1854. Look at the copy of page-25 below and note the author’s emphasis on the date of September, 1854. This caused me to do additional research concerning Francis Susalla. Fortunately, I was able to locate another page of Francis Susalla’s land purchase document and, in fact, it shows a date of September, 16, 1856, as can be seen in the copy shown below:I knew that my gr-gr grandfather, Francis Polk, was the second Pole to purchase land in Paris Twp. 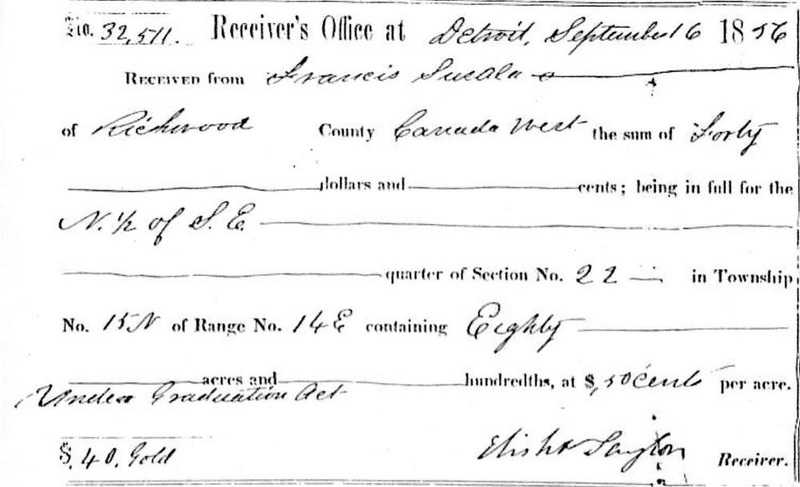 His land purchase document, number 32512, was dated September 16, 1856. It did not make sense to me that two land purchases with documents one number apart could have occurred two years apart. The other curious point was that the two documents bore a date with the month/day of September 16. Therefore, it is quite evident that Francis Susalla and Francis Polk both went to Detroit on the same day in September, 1856. On this day they became the first two Poles to purchase parcels of land in Paris Twp. This entry was posted on Monday, March 26th, 2018 at 8:38 pm and is filed under Charles Chase. You can follow any responses to this entry through the RSS 2.0 feed. You can leave a response, or trackback from your own site.